Update : 19/10/13 In the latest Tweet By MMX_NewsCaster, it has been specified that Micromax Canvas Turbo’s Camera will come with HTC Zoe like Object removal tool, which was one of the most revered features of HTC One’s camera. This object removal tool can remove any unwanted objects from the image or image taken from a video with an unwanted object in the backgroud, with a few clicks and works like magic. MMX Newscaster which introduces us to Micomax Canvas Turbo A250 couple of weeks back has revealed a Sketch of this upcoming device from Micromax which is being promoted by none other than Hugh Jackman! The Sketch gives us enough food to speculate what Micromax is offering this time and confirms a few things which were already known and expected. This phone will come with a Full HD display and the display size remains same as Micromax Canvas 4 at 5 Inches. The interesting thing revealed by this new leaked sketch is that this phone comes with Two Micro SIM slots on the sides, unlike what we have seen in Canvas series phones so far. This implies that Micromax is saving space at the back and might provide with a Unibody design without a removable back cover. Micromax might also be clearing space for a thicker battery. This might be a refreshing change in Canvas series, but a Non- removable battery might very well be a deal breaker for many. 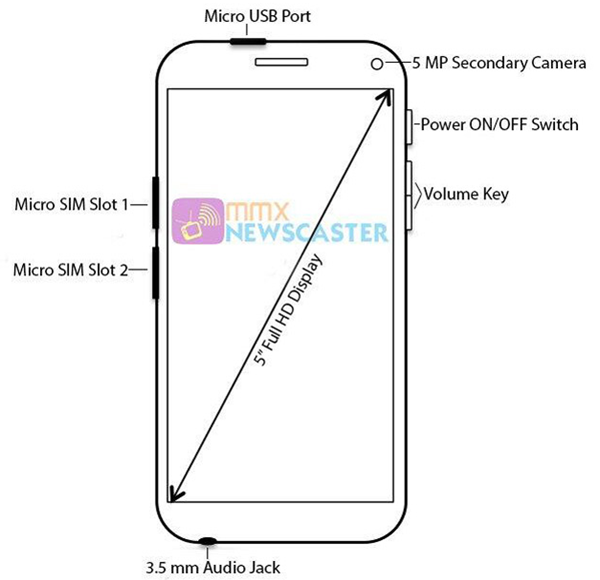 Due to 2 Micro SIM slots on the left edge, Volume Rocker and power key will be present on the same right edge and this is new body design language from Micromax. The secondary camera indicated on the front panel is 5 MP and the front camera is 13 MP which is maximum MT6589 series SoCs can support. The Processor is expected to be MT6589T considering the name turbo in the handset. Micromax may actually present with a larger battery in this smartphone instead of the usual 2000mAh we have seen in the canvas series so far. By roping in Hugh Jackman as its new brand ambassador and by series of leaks gaining enough attention, the Micromax seems to be in the right place right now. This phone will compete with phones like Intex Aqua i7 and Gionee Elife E6.